Time goes by so quickly, especially concerning the passing of a loved one. My mind just doesn’t want to wrap itself around the fact that it has been four years since my mom went to Heaven. I know that there are many people who have been without their parents much longer than I have, and they know exactly how I feel on this 4th anniversary of my mother’s graduation to Heaven. As I write this, I can think of so many things I would have loved to tell my mom, who was one of my biggest fans when it came to my writing. 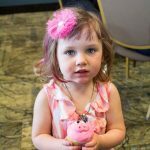 She loved the history stories, especially when it pertained to the family history. This year has been such a wonderful year for new and interesting finds, and it seems like I want to call her almost every day to tell her something new. And there are so many days I want to ask her about something I’ve discovered. Sadly, when we are young, we don’t realize just how important those family stories will become when we are older. Mom, was always the bringer of the sunshine to our house, singing to us when we woke up, when we were sad, or when we were happy. They were usually little one or two line songs, but they said it all. 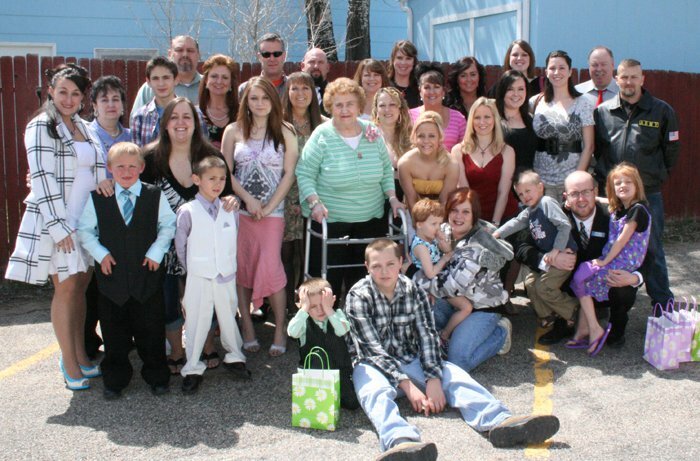 She told us little bits and pieces of life with her siblings, and all the singing they did, giving us a glimpse of all the laughter and fun that was our grandparents house when all the kids were there. Mom was the middle child in a family of nine children, and that probably gave her a unique view of things. She got to participate in the fun things the older siblings are doing, and she was still young enough to enjoy the things the younger siblings were doing. 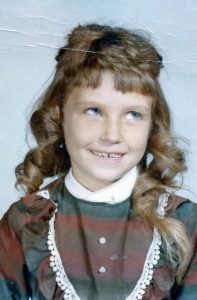 Being the middle child, born between the only two boys, put her in a unique position too. She got in on some of the antics the boys got into…much like the three musketeers. 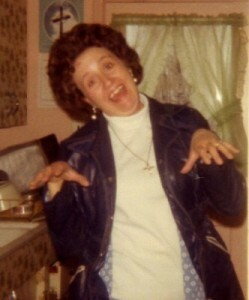 Mom always had a fun-loving attitude, and that made life with Mom lots of fun. Today marks my mom’s 4th anniversary in Heaven. While we know that she is having the time of her life, we miss her very much. We love you Mom. If holiday travel seems like a nightmare today, it was much worse in 1914. People didn’t travel from place to place in hours, but rather in days. These days, we hop on a plane and before the day is over, we are visiting with family on the other side of the country. 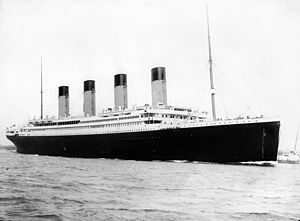 When I think of that era, of course, the Titanic comes to mind. People had to pack enough clothes for a year or so, because they couldn’t just go somewhere and stay for a week and then head home again. People had to travel with a purpose. The same applied to travel on land. 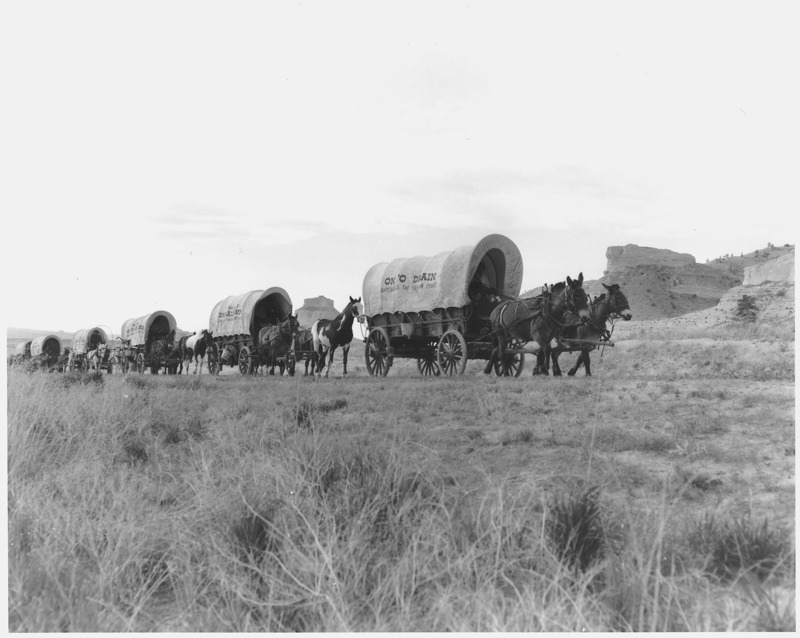 During the era of the wagon train, when someone went west, it was to move. All too often people might never see their families again. Of course, with the invention of cars, travel became less time consuming, and people could go to visit family a lot more often. Having family members move away, didn’t mean that they were gone forever and you would never see them again. Trips could easily be made for holidays, new babies, or just to visit. 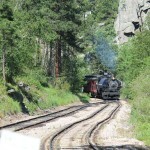 The railroad modernized travel because unlike the wagon train, the trains could go much faster. 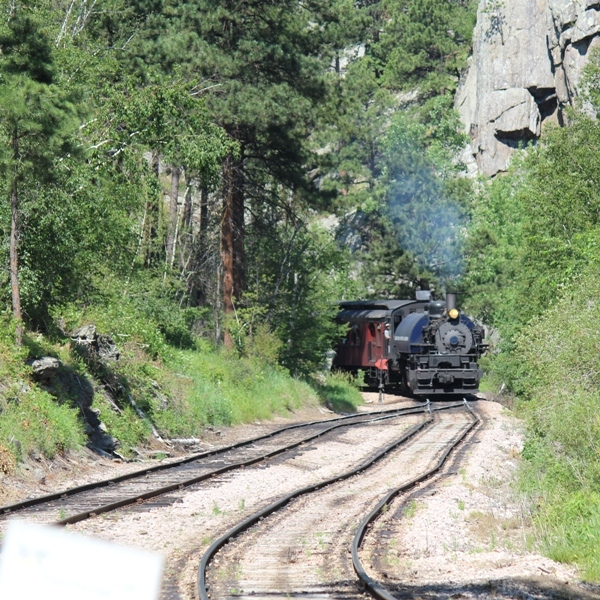 Even with cars, the train could get you there faster, because while you could only drive your car so far, the train kept moving throughout the night, often reaching your destination by morning. 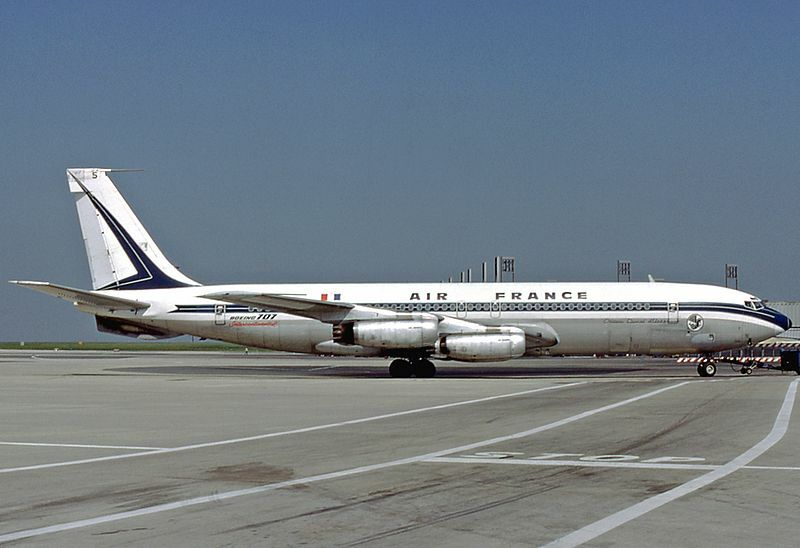 A trip that once took forty days, could now be taken in just five days. Even wars could be accomplished in a more timely manner…if that could be considered a good thing. When Britain sent out its troops when it declared war and invaded Germany, soldiers would have had to travel up to five days to reach Germany once the declaration of war was announced. Troops from New Zealand and Australia also traveled for several days in order to invade and occupy Samoa and German New Guinea, respectively. If a travelers from the United Kingdom wanted to make a trip to Australia, a former British colony in 1914, the journey would have taken at least a month and or more than 40 days. With trains, planes, and trucks, armies to get to the front much quicker. While this type of improvement is good, I’m not sure it was the type of travel that the inventors intended. Nevertheless, travel has greatly improved over the past 100 years or so, and I wouldn’t ever want to go back to the old ways. Since moving to Casper a year ago, our family has had the opportunity to finally get to know my nephew, Allen Beach and his wife, Gabby for the first time. 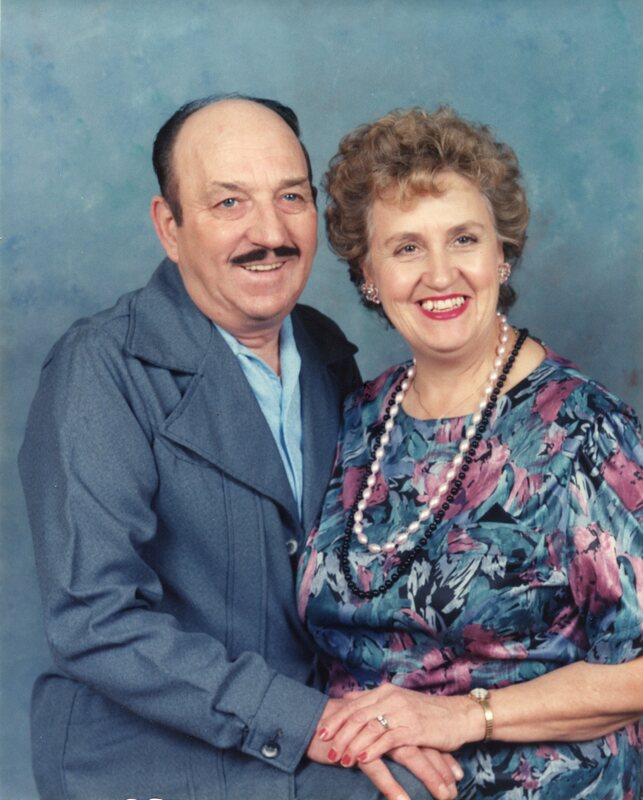 For the majority of his life, Allen and his sister, Andrea have lived in several areas of the western United States, so we didn’t see them often. 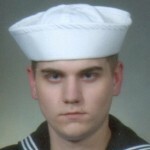 Later, when Allen joined the Navy, he lived in the Washington DC area and also in Japan. All these distances made us almost strangers to our nephew and the bride he met in the service. Now all that has changed, since Allen and Gabby have moved to his mother and step-father’s place west of Casper, Wyoming. 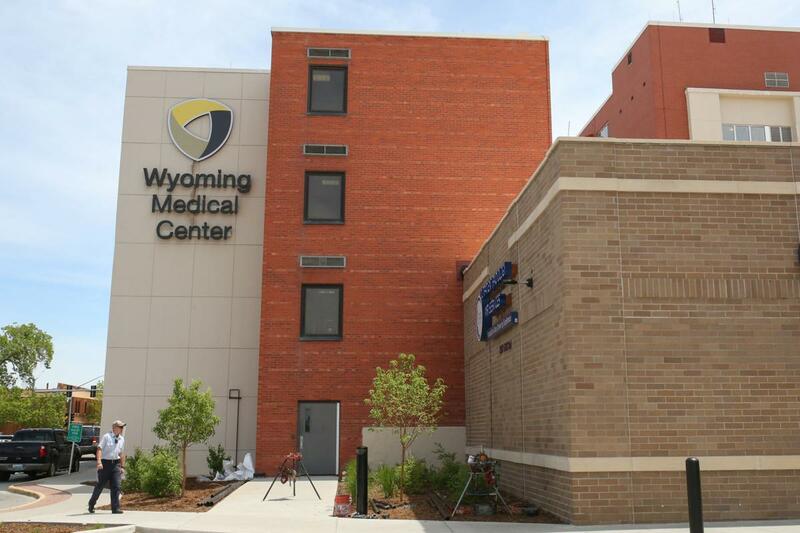 Gabby is getting ready to start nursing school, and with his schooling behind him, Allen has landed a great job at Wyoming Medical Center as department manager over the referral and communications departments. It is a job that Allen has worked hard to prepare for and one that he really loves. Recently, Allen was instrumental in something that is near and dear to my heart, and one that brings tears to my eyes every time I think about it. Shortly after my husband, Bob had a heart attack, on October 14, 2018, we were able to either meet or friend on Facebook, all of the people who were instrumental in saving his life. Of course, we hugged and thanked them, but I never felt that it was enough for all that they had given me. They took time out of their day to respond to a terrible situation, and as a result, I still have my husband. I can never repay them…we can never repay them. I wanted to do more. 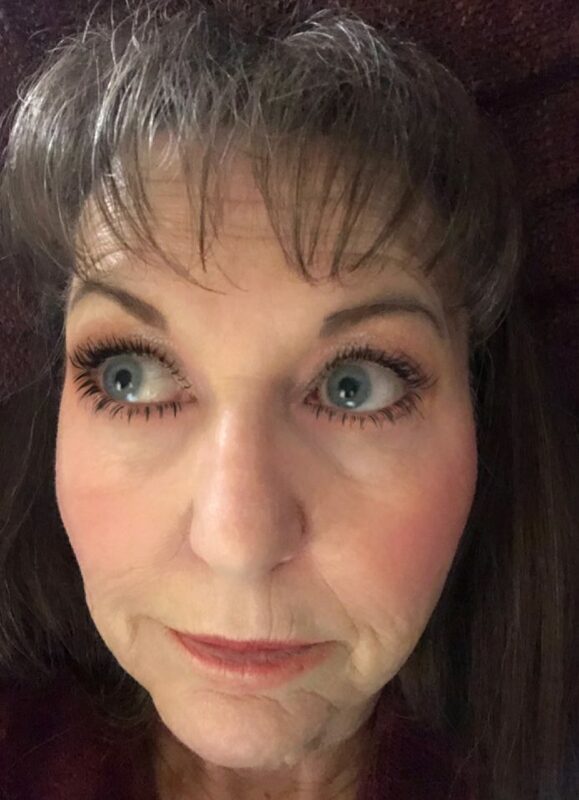 I wrote a story, but I had no way to connect it to our angels…until Allen asked me if we would agree to be interview for a story on the hospital’s website. We jumped at the chance, and he arranged it for us. It was a way to tell all those people that they would always be our angels. More importantly, it was a way to tell the world about these amazing people. So many people might not have known about our miracle, if it weren’t for Allen, and we will be forever grateful to him for making the arrangements for us. Allen has such a kind and loving heart, and he will always be a great blessing to us. Having Allen and Gabby here in Casper has been such an amazing blessing in so many ways, and we are so happy that they are here. Today is Allen’s birthday. Happy birthday Allen!! Have a great day!! We love you!! One of the funniest parts of a movie or television program is the bloopers…the many takes that were completely blown. We have all laughed at the hilarity of it all. Well, in my years of writing, I can tell you that movies and television programs aren’t the only places that one finds bloopers. Normally, I proofread my stories before I post them, and I usually catch most errors. Nevertheless, like most editors, it pays to have a backup plan. For me, that backup plan is some of my readers. My sister, Cheryl Masterson is my main backup proofreader, and she has picked up some doozies!! From botched math, resulting in the wrong age being listed for one of the subjects, such as saying that my Uncle George was 94, when in reality he was 92, to botched spellcheck resulting in a totally wrong word in a sentence making it say something completely wrong and usually goofy, Cheryl has seen it all. She caught one the other day, where I called my Aunt Evelyn…Aunt Evenly. Invariably, I will get a text telling me that I have a blooper in my story. I am grateful that Cheryl usually reads my story pretty quickly after I post it, meaning that a minimal number of people have seen that embarrassing blooper. Nevertheless, some have seen it and I’m sure they laughed about some of them. Sometimes it isn’t really a blooper, but rather calling something a name that could embarrass the subject. Such was the case with a story about my great grand niece who loves lip balm. It was ok to call it lip balm, until I said it belonged to her daddy. After that I was informed that it was chap stick, because men would never use lip balm. Hahahahaha!! Needless to say, my sister missed that one, but her daughter Chantel Balcerzak and grandson, Jake Harman certainly didn’t. Every year I have bloopers in my stories. It is inevitable, l suppose. Then, a few days ago Cheryl suggested that I should write a story about the bloopers. I must say that I was intrigued with the idea. Of course, if I am to continue a yearly blooper story, I will have to keep better track of the many bloopers for the year. Whether I am able to relay them all to my readers or not, I know that for those who catch them, and for me, the bloopers do add a little laughter to my blogs and my days. There are many ways to get hurt, but one of the most dangerous is the stampede. Caused by people pushing the people in front of them. It can lead to serious crush injuries. In December of 1991, at a City College gymnasium in New York, New York, a benefit basketball game was being held to benefit AIDS education. In a zealous attempt to bring in as much money as possible, the facility was jammed with as many as 2,000 people over capacity. To make matters worse, a group of gate-crashers tried to push their way into the already overcrowded gymnasium. Thus sparked a stampede that crushed hundreds of ticketholders at the bottom of a basement staircase. Most of the injuries happened near the door to an underground gym that was packed with thousands of spectators. The problem with this type of situation is the the people in front get pressed tightly between a wall, and the people behind them. 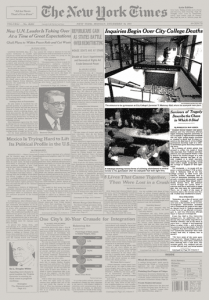 Chief medical examiner, Charles Hirsch said, “the eight people killed all were asphyxiated…squeezed front to back…in the stairwell.” The victims included three women and five men and ranged in age from 16 to 28…Sonia Williams 20, Leonard Nelson 17, Dirk Swain 20, Charise Noel, Jubal Rainey 15, Yul Dargan 24, and Darren Brown 29, were among the dead. Videotape shot from the bleachers revealed a seriously overcrowded gymnasium…at least 2,000 people more than its legal capacity of 2,730 and that tickets were still being sold at the door. “It was oversold,” said Mayor David Dinkins. The stampede pushed most of the victims down the stairs, squeezed them through a doorway and onto the gym floor. They tripped and fell over others waiting there, only to be crushed themselves by the next human wave. “It was a cone effect,” said ambulance worker Sy Collins. “The door opens and there were bodies on the floor and people were just running over them.” Bodies piled up as many as six high. 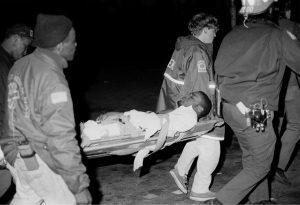 The 29 people who sustained crushing injuries included five Emergency Medical Service staffers, some of whom were mauled as the crowd fought over their services. 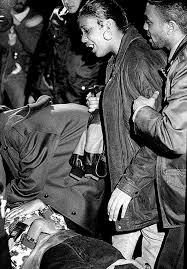 According to authorities and witnesses, by late afternoon thousands of people had lined up outside the City College gym in upper Manhattan for what was billed as the “Heavy D and Puff Daddy Celebrity Charity Basketball Game” to benefit AIDS education. The teams were to be captained by Heavy D and Puff Daddy, both rap stars. A recorded telephone message told callers that all of the $12 advance tickets had been sold, but that tickets could be bought at the door for $20. Chief of Patrol Mario Salvaggi said the school’s security director called the police before the game and asked for help because the event was sold out. Police who arrived at 5:00 p.m. found a crowd of between 500 and 700 were milling around outside on Convent Avenue. The game was scheduled to start at 6:00 p.m., and the doors opened at 5:00 p.m. Ticketholders passed through a glass door at street level, walked down a 12 foot wide staircase, and passed through a single metal door into the gym. By 7:00 p.m., the game still had not started, and people out on the street began pushing to get inside. A locked glass door was smashed, and people rushed into the gym building. Randy Jones, 30, of the Bronx who was standing inside the door to the gym, said that a woman collecting money at the door got up, took a can holding the night’s receipts, ran into the gym and closed the metal doors behind her, leaving the crowd up in the stairwell. Eventually event organizers began letting people from the stairwell into the gym, but only a few at a time, Jones said. Finally people from the stairs began streaming into the gym, colliding with scores standing inside the door. Soon the floor was covered with injured people. We hear many things about the different Indian Wars and battles. We also know that many of these wars were unnecessary, and were largely due to broken treaties that were made between the White Man and the Indians. Because the population of the United States was inevitable, I don’t know how we could have possibly left so much land exclusively for the use if the Indians, but there must have been better ways to work this out. Nevertheless, once a population explosion starts, it is impossible to stop it. Of further concern to the government were the spiritual beliefs of the Indians. Throughout 1890, the United States government worried about the increasing influence at Pine Ridge of the Ghost Dance spiritual movement. 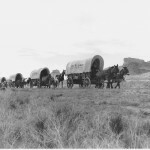 The movement taught that the Indians had been defeated and confined to reservations because they had angered the gods by abandoning their traditional customs. This movement prompted many Sioux Indians to believed that if they practiced the Ghost Dance and rejected the ways of the white man, the gods would create the world anew and destroy all non-believers, including non-Indians. The situation escalated when on December 15, 1890, reservation police tried to arrest Sitting Bull, the famous Sioux chief, because they mistakenly believed he was a Ghost Dancer. In the process of his arrest, they killed him, thereby increasing the tensions at Pine Ridge. Then, on December 29, the U.S. Army’s 7th Cavalry surrounded a band of Ghost Dancers under Big Foot, a Lakota Sioux chief, near Wounded Knee Creek. They demanded the Indians surrender their weapons. Immediately, a fight broke out between an Indian and a U.S. soldier. A shot was fired, but it’s unclear who fired first. A brutal massacre followed, in which it’s estimated that between 150 and 300 Indians were killed, nearly half of them women and children. The cavalry lost 25 men. 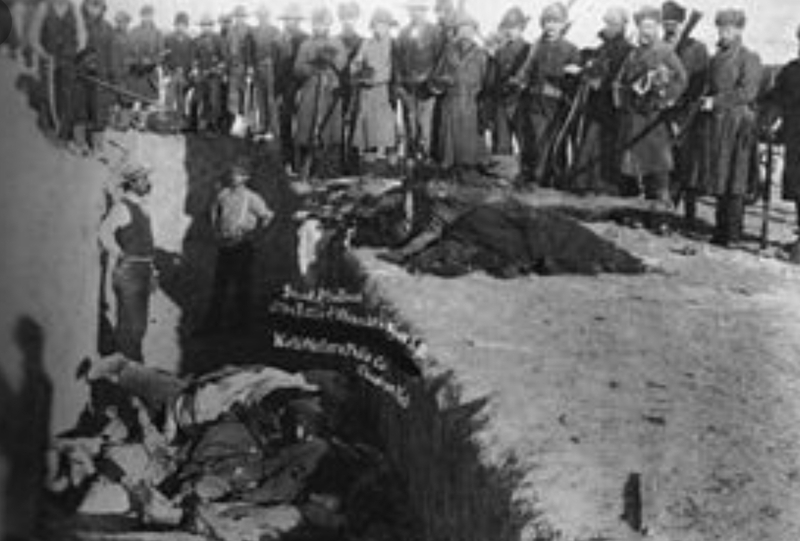 The conflict at Wounded Knee was originally referred to as a battle, but in reality it was a tragic and avoidable massacre. Surrounded by heavily armed troops, it’s unlikely that Big Foot’s band would have intentionally started a fight. Some historians speculate that the soldiers of the 7th Cavalry were deliberately taking revenge for the regiment’s defeat at Little Bighorn in 1876. 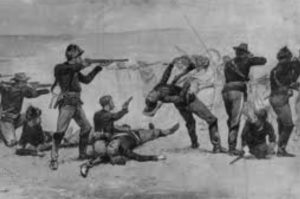 Whatever the motives, the massacre ended the Ghost Dance movement and was the last major battle in America’s deadly war against the Plains Indians. After an earthquake, especially a big quake, you start looking for damage or reports of damage. You will invariably find damage, unless the quake occurred in an area that is completely unsettled or in the ocean. Still, you have to look well beyond the epicenter of the quake…sometimes as far away as 6,000 miles. A big quake can shake things up for many miles. 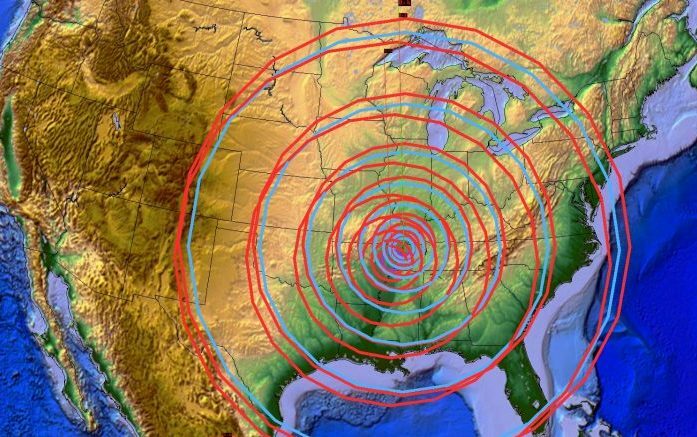 On December 16, 1811 a series of Intraplate earthquakes began, that shook apart the area of the New Madrid fault in present day Missouri, around the Mississippi River. Intraplate earthquakes are often confused with Interplate earthquakes, but are fundamentally different in origin, occurring within a single plate rather than between two tectonic plates on a plate boundary, like the Interplate earthquake does. The specifics of the mechanics by which they occur, as well as the intensity of the stress drop which occurs after the earthquake also differentiate the two types of events. Intraplate earthquakes have, on average, a higher stress drop than that of an Interplate earthquake and generally higher intensity,meaning they can bring more damage. These Intraplate earthquakes continued until February 7, 1812. The first earthquake on December 16th had its epicenter in northeast Arkansas and measured up to an 8 on the Mercalli intensity scale. This earthquake was followed by another six hours later, and two more on January 23rd and February 7th, respectively. The third quake caused warping, magma eruptions, fissuring and landslides. While these were unusual events for the area, the were far from the most unusual events related to this series of quakes. After the February earthquake, it was reported that the Mississippi River began running backwards, and event that lasted for several hours and caused two temporary waterfalls to develop. The upthrusting of land caused the formation of Reelfoot Lake 15 miles south of the epicenter while the crushing of quartz crystals underground created flashing lights that lit up the sky. Boatmen on flatboats actually survived this experience and lived to tell the tale. Incredibly, the earthquakes could be felt over 50,000 square miles. That is shocking when you think about the fact that the 1906 San Francisco earthquake, which was deadly enough in its own right, was felt over 6,000 square miles. 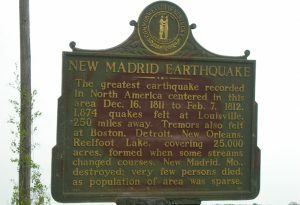 The New Madrid earthquakes were the biggest earthquakes in American history. While they occurred in the central Mississippi Valley, they were felt as far away as New York City, Boston, Montreal, and Washington D.C. President James Madison and his wife Dolly even felt them in the White House, and church bells rang in Boston. 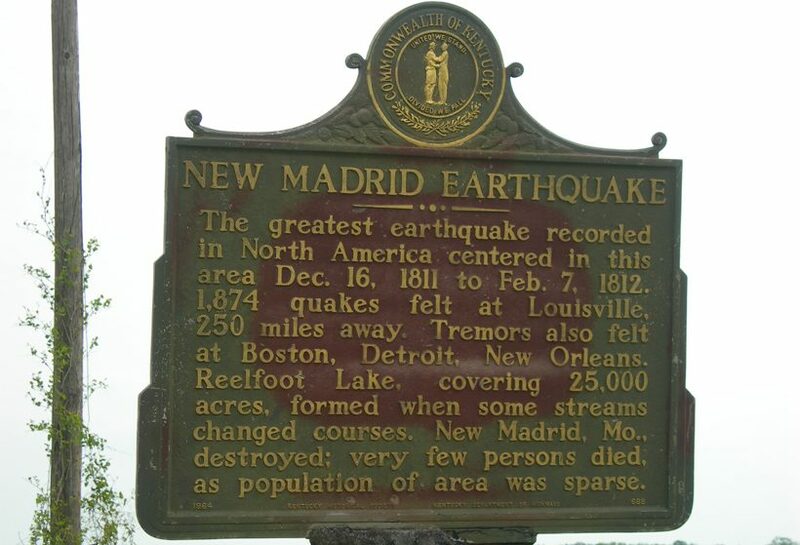 From December 16, 1811 through March of 1812 there were over 2,000 smaller earthquakes in the central Midwest, and between 6,000-10,000 earthquakes in the Bootheel of Missouri where New Madrid is located near the junction of the Ohio and Mississippi Rivers. 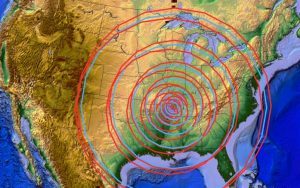 In the known history of the world, no other earthquakes have lasted so long or produced so much evidence of damage as the New Madrid earthquakes. Three of the earthquakes are on the list of America’s top earthquakes: the first one on December 16, 1811, a magnitude of 8.1 on the Richter scale; the second on January 23, 1812, at 7.8; and the third on February 7, 1812, at as much as 8.8 magnitude. Water thrown up by an earthquake was lukewarm. 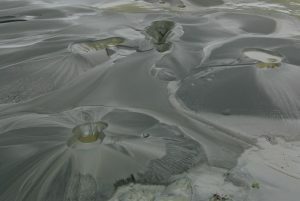 It is speculated that the shaking caused the water to heat up and/or quartz light heated the water. The skies turned dark during the earthquakes, so dark that lighted lamps didn’t help. The air smelled bad, and it was hard to breathe. It is speculated that it was smog containing dust particles caused by the eruption of warm water into cold air. Sounds of distant thunder and loud explosions accompanied the earthquakes. People reported strange behavior by animals before the earthquakes. They were nervous and excited. Domestic animals became wild, and wild animals became tame. Snakes came out of the ground from hibernation. Flocks of ducks and geese landed near people. I’m sure that some of these events could be viewed as normal during n earthquake, but certainly some of them or even the mere numbers of these phenomena could be viewed as very strange, and I don’t know that there has ever been a more strange earthquake before or since. When someone is killed in a war, we are always in the hope that they will be found quickly, and identified by their friends, so that their remains can be returned to their family for a proper burial. Unfortunately, that is not always the case. Nevertheless, we hope that the time passing between death and identification is a very short amount. 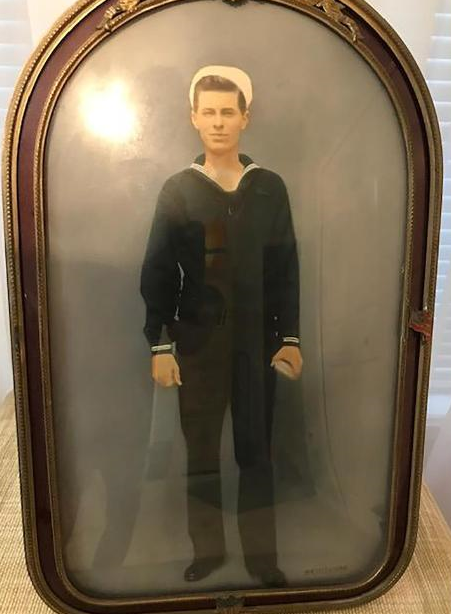 Unfortunately that was not the case with Carl David Dorr, who was one of the 429 sailors and Marines killed on board the USS Oklahoma when it was sunk in the Japanese attack on Pearl Harbor. 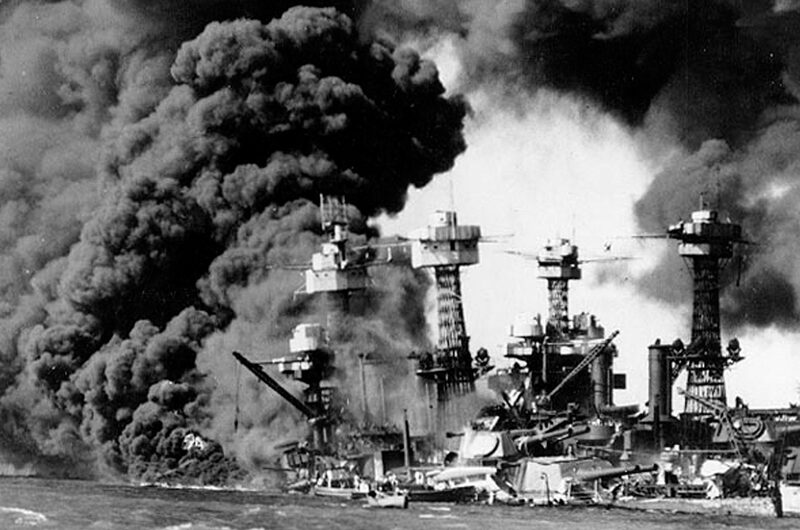 Only 35 people on the ship were positively identified and buried in the years immediately following the December 7, 1941, military strike, according to the Defense Department. The unidentified remains were buried as unknowns at the National Memorial Cemetery of the Pacific, which fills the Punchbowl crater in Honolulu. 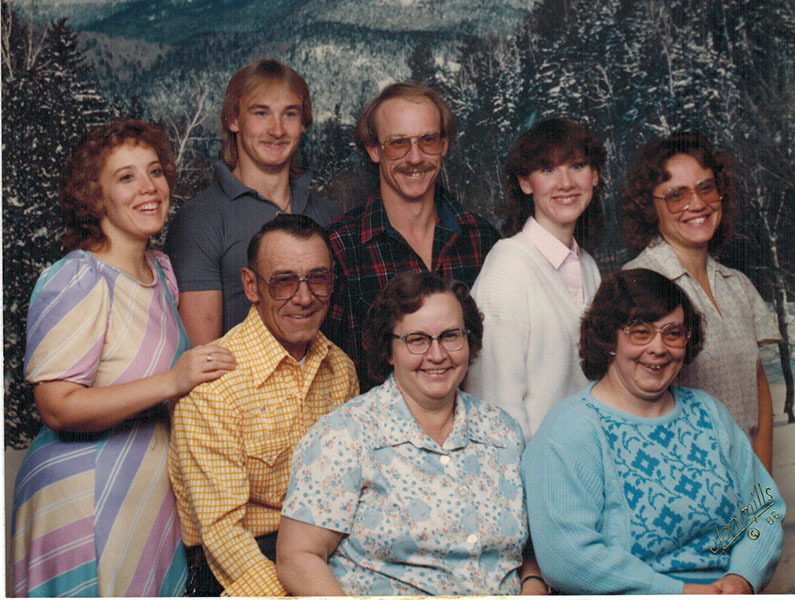 For 77 years, Dorr’s family has been waiting and wondering what became of him. They knew he was at Pearl Harbor, and that he was on the USS Oklahoma. The bodies were there, but they could not be identified. I can’t think of anything that would be more frustrating than that. Sadly, the wait was beyond long…it was 77 years. When I think about his family, first losing their 27 year old son, and then not being able to bury their son. They died without that closure. Carl’s family, like most American families, gathered around the radio on December 7, 1941. The news was grim. They didn’t know much yet, but they knew Carl’s ship had been attacked. With sinking hearts, they tied to hold out hope that by some miracle, he had survived. 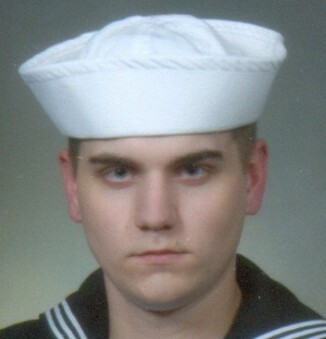 Then, they received the crushing news that he was missing in action…then, presumed dead. After the Defense Department began DNA collection in 2009, his family provided samples in hopes that one day it would help identify Carl’s body, his nephew said. 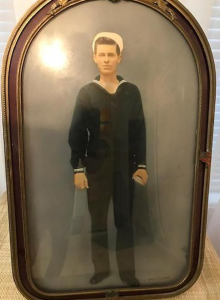 His mother kept an heirloom photograph in her living room “so she could keep an eye on him,” Thomas Dorr said. She was able to see her son every day, even if he never made it home at all. And, of course, he never did, at least during their lifetime. Recently, the DNA provided for identification purposed, finally paid off. Dorr’s body was finally identified, and he was going home at last. About 15 of Dorr’s relatives walked onto the tarmac of South Carolina’s Greenville-Spartanburg International Airport. 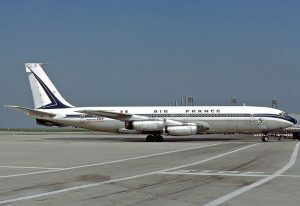 As they watched, a flag-draped coffin was lowered from the plane into a hearse. “There was nothing but dead silence,” Carl’s 70-year-old nephew, Thomas Dorr, who lives in St. Johns, Florida, told CNN. “I knew that what I was experiencing was history.” Carl David Dorr was finally going to be laid to rest, and how fitting that his funeral would be held on the same day that he died, December 7, but 77 years after the day he died…Pearl Harbor Day. My grand-niece, Hattie Parmely is the middle child of my nephew, Eric Parmely and his wife, Ashley. 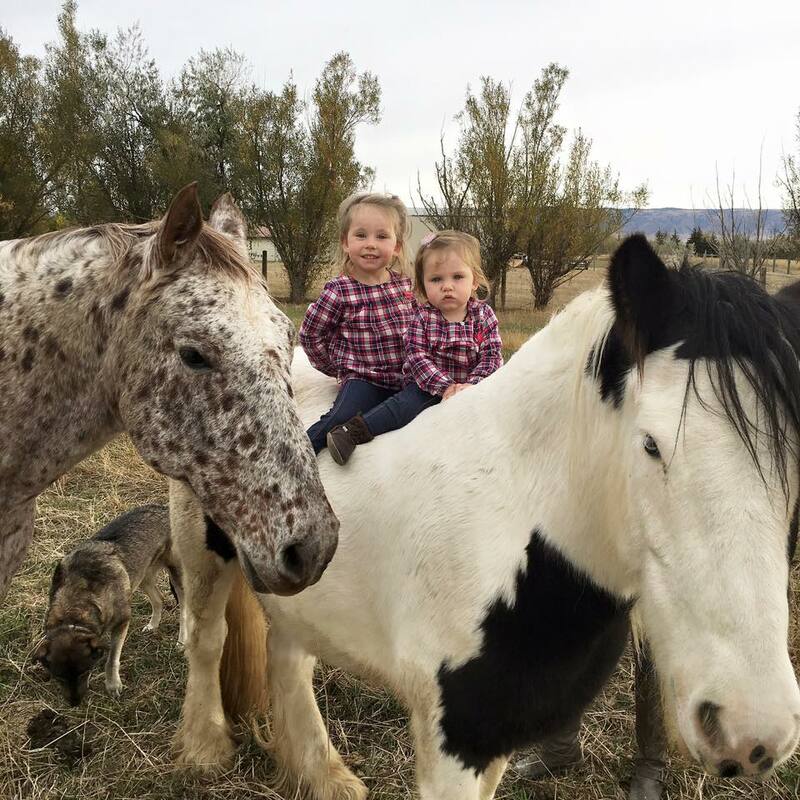 Hattie and her siblings are being raised on a little farm outside of Casper, Wyoming. 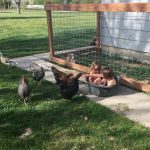 I am amazed at how well Hattie and her siblings get along with the animals in their care. Children are not always careful with animals, but those who are raised around them, have a heart for their animals. Hattie is a soft-hearted girl anyway, and I think her animals know that about her. Hattie and her siblings have a trampoline, and they love spending time on it. Most of us would just love to have the energy to jump on a trampoline for hours at a time, but lets face it, most of us would get tired after 5 minutes. It is the common problem that adults have when it comes to kids, and their endless energy. Of course, kids get lots of sleep with naps and all, and I don’t know how well Hattie naps, or anything, but if sleep has anything to do with her energy level, I would say she naps or sleeps pretty well. Having a big sister, Hattie had a helping hand in learning all the cool things to do around their place. Reagan, Hattie’s sister, has taught Hattie and their little brother, Bowen many things about life on the farm. Things like milking the goats, or just playing with the goats, in general. The girls totally love the goats…especially when they are babies, and Bowen is quickly becoming a big help with the animals too. 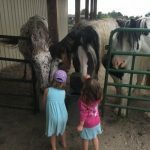 Life on the farm is not only active, but is usually spent mostly outdoors. We hear about kids today being couch potatoes, but Hattie and her siblings don’t have time for that much. They are always busy doing things out in the yard or with the animals. Cleaning out the pens and feeding the animals are high on the priority list, and they like that very much. 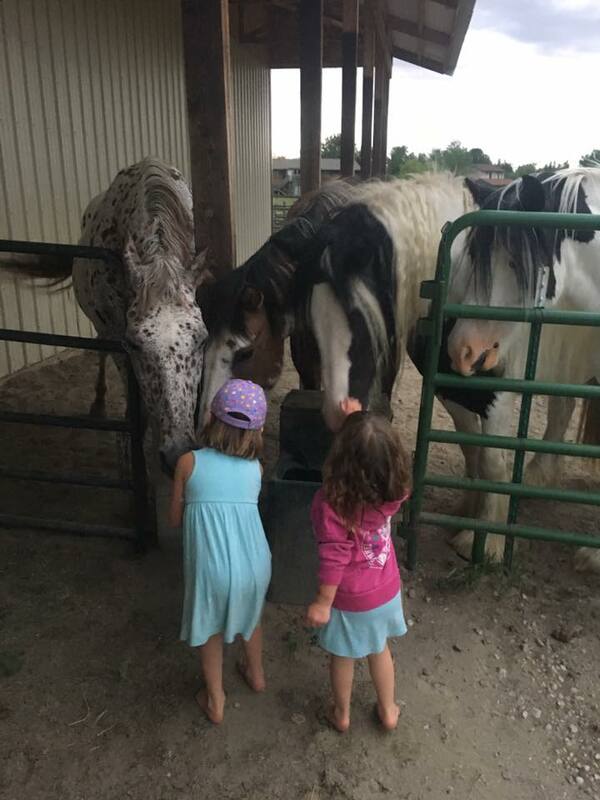 Animals depend on their owners to take care of them, and the Parmely kids are great animal owners. Their parents are proud of all the help their kids give them in running the little farm. Hattie is a big part of that, and will be an even bigger part of it as she grows. Today is Hattie’s 4th birthday. Happy birthday Hattie!! Have a great day!! We love you!! It makes me sad to think that my father-in-law, Walt Schulenberg has been in Heaven now for over 5 years….not sad for him, but for me. 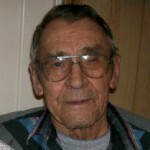 He was such a sweet man, and having him for a father-in-law was always a blessing. 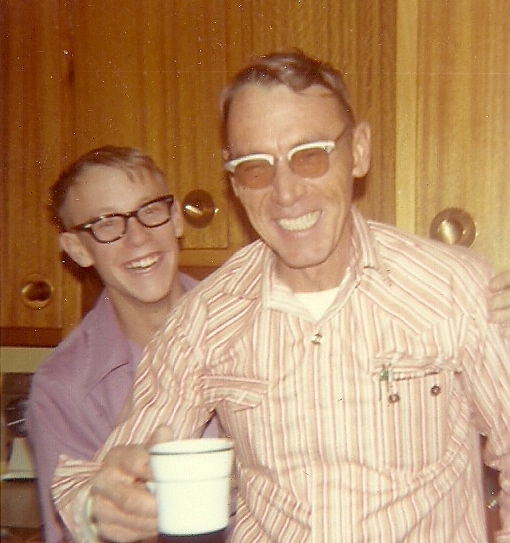 When I first met my father-in-law, I liked his sense of humor, his willingness to help others, and his love of family. 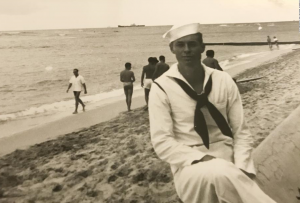 Early on, I probably would have said that my husband was very different that his dad, but as time went on, I realized that he really wasn’t. I discovered that the traits that I love about my husband came to him from his parents, and especially his dad. I think that is more common than we know, and the older each of us gets, the more we notice the traits of our parents. It is very much their legacy, living in their children. 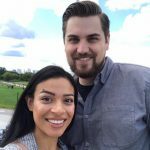 I began taking care of my in-laws in 2007, and my father-in-law was somewhat surprised that I would devote so much time to them, but in reality, they were like second parents to me, and they had given me so much…not just in things, but in the gift of their wonderful son to be my life partner. 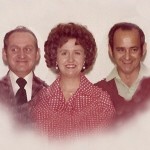 They showed him how to be the amazing man I married, so how could I possibly not show them how great I knew they were. Life is a cycle. We raise our children with the hope that they will find someone to share their life with, and who will share their family too. 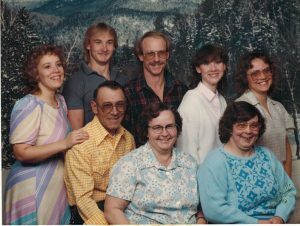 My father-in-law was a great dad to his kids, in-laws, and grandkids. I feel very blessed to have known him. Dad was a great teacher. He taught both of his boys to work on cars, build things, and to be responsible hard working men. His boys, and his girls too, have all become responsible, successful people, who all helped to take care of their parents as the end approached. It was their way of giving back to the wonderful people who raised them. It is sad to know that they have passed on now, and we do miss them very much, but we also know that they are not hurting or suffering in any way now, and that makes the pain of loss easier to bear. Today would have been my father-in-law’s 89th birthday. Happy birthday in Heaven, Dad. Thank you for the gift of your son, Bob, who is the love of my life. You raised him well. We love and miss you very much, and look forward to seeing you again in Heaven.